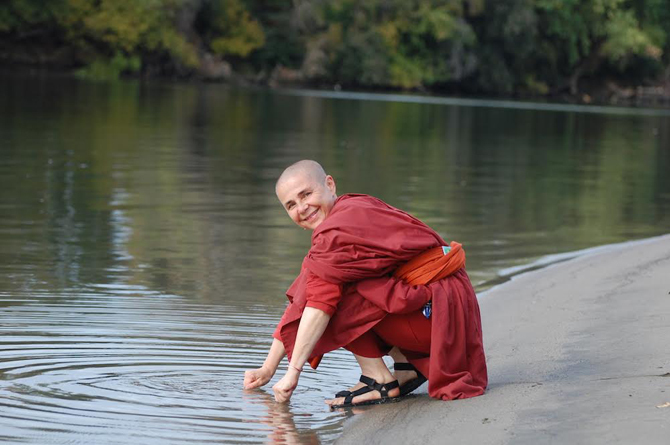 Ayya Santacitta and Ayya Anandabodhi are two Buddhist nuns who came to the U.S. from England in 2009 in order to found a residential monastic nuns’ community in the style of the Theravada Forest Tradition. Two years after they arrived, they broke with the order in which they had trained so as to pursue full Bhikkhuni (nun’s) ordination, which, until a recent worldwide revival, had not been available in the Theravada tradition for almost 1,000 years. They received ordination on October 17, 2011 at Spirit Rock Meditation Center in Northern California. 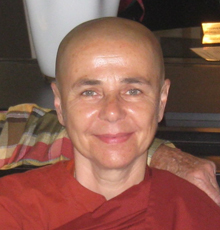 In 2012, they were joined by Anagarika Maria, who received bhikkhuni ordination at their community, Aloka Vihara, on November 1, 2014. 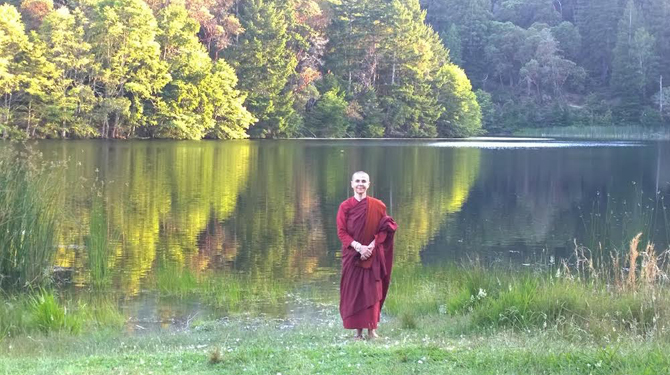 I became even more curious about these nuns when a friend directed me to talks in which they take on the issue of our ongoing destruction of the biosphere with a directness and a passion that, as far as I have been able to tell, is rare in Buddhist communities. http://saranaloka.org/teaching/eco-dhamma/ As I read through their teachings and listened to their talks, I was moved by their obvious commitment to living in truth—or in Ayya Santacitta’s words, “To live a life that is congruent with what we know to be true.” Their website includes a long list of resources on climate action. In fact, Ayya Santacitta, the subject of this interview, traveled across the country on the climate train in September 2014 to participate in the Climate March, of which she said: “It was not just a dead serious march—but a celebration of becoming a channel for the Earth and to speak on behalf of Nature.” Recently, she co-organized an interfaith climate march in Sacramento (a photo gallery). Ayya Santacitta graciously agreed to be interviewed for an hour in January, just a week before the three nuns were about to embark on a three-month silent retreat. Subsequently, I had the good fortune to be able to sit a weeklong monastic retreat in April, at IMS, with her and Ayya Anandabodhi. It was more moving than I can say to sit before a shrine centered on the earth and two women who, moment by moment, so actively and passionately embodied devotion. As a long-time feminist, I was interested in your having founded this training monastery/residential monastic community for women. The other thing that interested me was your directness and your passion about what is happening to our planet. With the exception of Thich Naht Hanh, I wasn’t seeing this in other Buddhist communities–even where there’s lip service played to activism. There is a fire in your response that excites me. I used to think Buddhism was always about a commitment to living in truth, but in practice it seems it isn’t always. But doesn’t everyone have their own truth? We all look at it through our personal karmic lens. Well then I guess some of our personal karmas allow us to take in more of the truth, and my sense is that you and Ayya Anandabodhi take in more of the truth, more of a complete truth. We have been forced by circumstances to step out in a big way. My first teacher in Asia left the city monasteries and went back to nature and lived in a dilapidated old temple in the south of Thailand. He became a well-known teacher, attracting many Western disciples. I stayed with him for some time, and then I came to Amaravati Monastery in England where I met Ayya Anandabodhi and we practiced in this big monastic community for fifteen, sixteen years. And then, because women were not allowed to have an equivalent ordination to the monks, though this was offered to women by the Buddha over 2500 years ago, in the end we decided to leave the community, though we liked it there and we had a good training. But we wanted to have the full ordination because we were invited to come to America and establish a training monastery, and when we were here on the West Coast, it became clear to us that if you want to offer something to women in this part of the world it needs to be the real thing. It was an unfolding, really. It came clear to me through study, having read about feminism, and studied other things, the connection between the oppression of nature and the oppression of women, and then it wasn’t a far stretch to feel connected to the environmental movement and that was what gave me the extra kick to leave it all behind. So the ordination wasn’t the real motivator, only when I connected it with the bigger whole, such as the environmental movement… only then did it become a big impetus. It seems the environment has been part of your mission from the beginning. Vandana Shiva has been a big influence in that respect, hearing her talks and reading her work seeing so clearly the connection between the oppression of women and the environment. And then Thomas Berry, who wrote that this whole universe is actually a spiritual scripture and increasingly through evolution we are waking up to the oneness of it all and seeing ourselves as part of it. Those two have very much influenced me. My Buddhist practice is very much situated within this framework. That’s what I intuited, it’s why I wanted to do this interview. Yes, this was the other push in stepping out from the old safe environment and coming to this small place, leaving behind the security of this huge lineage which has hundreds of monasteries. I should say “security” in quotes. I don’t know if you know Mary Daly, the great feminist philosopher. She writes about the spider in freefall, who has to jump into the void in order to spin her web. Yes, it was like that, and it still feels that way. We’re out in the Sierra Foothills near Placerville, we’re three nuns with a manager, tomorrow we’re having our first novice ordaining and now taking on this property and developing it. It’s a tall order, we’re not builders or anything. And as you know, women are not as well-supported as men in Buddhism. Absolutely not. And we’re not where the money is. So all of this takes a lot of courage. Thank you. But you know, it didn’t feel like a choice, it was just clear this is what needs to be done. I love that you’ve made it clear that this wasn’t just about you and your spiritual growth, it’s on behalf of the whole planet. Well, also because I can’t make that separation anymore. If you’ve been practicing for a certain amount of time, you just can’t do it. Yes, you would think so, but I don’t hear this that often from other Buddhists. That their own spiritual evolution and the state of the planet are indivisible. For me, I can’t think otherwise, I feel it within myself, in my body. Well yes, it is in our bodies! Yes, after all we are made of the same stuff. I want to return to what you said in the interview after the climate march, that there is no difference between responding to climate change and practicing the Dhamma. Can you say more about this? Well, the Dhamma is a body of teaching that was given by the Buddha and is a recipe for letting go of greed, hatred and delusion in the mind, and it’s exactly these things that are responsible for actions that are out of synch with reality. Climate change is part of that because you can’t on a finite plane live in a way that’s so growth-oriented that it’s completely out of touch with what’s possible. And it’s all driven by greed, hatred and delusion. Any spiritual practice is about seeing through this and letting it go, aligning yourself with the laws of nature. One translation of “Dhamma” is nature, or the laws of nature. For example, in the Thai language, dhammajati means “natural,” it’s really about aligning yourself with the laws of nature. And not only how a tree grows or a fish swims, but how the mind works—it’s all the laws of nature. These laws permeate reality and we can get to know how they work so we can align ourselves. When we work against them there is always something there to do with greed, hatred and delusion. The mind is contracted and unaligned. So then, is part of the practice coming to know what the laws are? Yes, exactly. It’s about how to cultivate the mind to be in greater alignment, which means letting go of greed, anger and delusion. I think if people see the connection between deluded mind and climate change—I see this as a great motivator. If people can see the connection they feel even more motivated to practice. Yes, as you said in the climate action video, you see this as an opportunity. There I am very influenced by both Thomas Berry and Joanna Macy. The planet is holding up a big mirror now, and we need to make an evolutionary leap, to put energy into finding ways to work together. There is inequality on the planet on so many levels. Rich countries go and cut down the forests, steal all the resources and leave chaos behind, people are uprooted, have lost their way of life and are left with a mess. That’s the foundation this continent is built on, it’s what we did to the indigenous people here. So the way you see it is, the urgency of the situation could push people to see that there’s something profoundly wrong with the way we’re living on this earth. Wonderful. I also want to ask you—you’re about to go on a silent retreat, you won’t be doing anything activist at all for three months and I want to know—one of the questions this journal exists to ask is, “how do we live in response to what’s happening?” In a moment-to-moment way, is there anything you can say about how you see your life as a response? I see it more as an offering now. I’m now 56, and in the younger years you have a very strong, concrete vision of where and how to live your life. Now, since menopause, more and more I just let it unfold. I have been trying for a very long time to create a certain thing, now I have run out of that kind of energy, and I am where I am and I just work with whatever comes up. I don’t know where it’s going to lead. So you’re saying everything you do is a response, you can’t separate it out. It’s just how your life is unfolding. That’s right. I can’t separate it out. It’s not as if I don’t make decisions and distinctions, but it feels more like … like a river. Like a big river. It doesn’t mean I’m always happy, sometimes it’s very painful. So you live in response to the conditions that present themselves. Yes, it really feels like that. For example, we didn’t know where we were going to go, we just thought “West coast” and now here we are in the Sierra foothills in this tiny town, we’re actually twenty minutes outside the town, and I don’t really know how we got here. Before we had a house in San Francisco a block from the beach, and now here we are in the forest, there is forest all around. Well, that must be good. Yes, it is good, but it’s also isolated. When you’re pioneers the way we are, there’s a lot of work. And we’re a small group of women and it’s not always easy. We have a dormitory where three women can stay as guests for a few days to several months. But it is beautiful, we have no light pollution so we see the stars, and we have deer, bobcats, coyote, turkeys. You mentioned somewhere that you wanted to live in nature because you wanted to listen to her, to hear what she had to say. What is she saying to you? You know we are trained in the Thai Forest tradition and we now call ourselves nuns of the Theravada Forest Tradition in the West. The forest tradition, like most spiritual traditions, has a wilderness component. Those who go out into nature and live simply, and the main emphasis is on meditation, not so much study. You can learn so much from nature, you go in the forest and impermanence is everywhere. Being in the forest, in a quiet forest, you can learn so much from the trees. The presence of the trees just grounds you. The laws of nature are at work and you can tune into them. Just listening to nature is the same as listening to truth. You can access truth through understanding the laws of nature deeper and deeper. In the climate action talk you said something I wanted to hear more about. You said we need to get out of the way and let evolution take its course. What I meant is the ego part needs to get out of the way and intuitive awareness has to take over. This is what I mean: there is less and less of a clear agenda, it’s more of a going with the flow. You respond in whatever way is possible in the given situation. We are teaching a retreat at IMS in April called “Listening to Natural Law” and we taught a retreat at Spirit Rock last year with that title, and wherever we teach, we have a three-dimensional picture of the earth in the center of the shrine—so the Buddha kind of sits on the planet—and we introduce the planet as being our teacher. We present this as a given, nothing special, just how it is. As you know, there are Buddha statues where he has one hand touching the earth. In the night of his enlightenment this is what he did, he touched the earth and called her to witness that he has the right to be here and to be enlightened. He was supported by the earth, just as we are being supported by her right now. It’s not difficult to bring it all together. So I guess this long silent retreat ahead of you is something you’ve been waiting for for a long time. Do you have any aspiration for yourself in these three months? I think I want to work more with acceptance, you know, getting to know the banks of the river… and more kindness, for myself and for others. I think that’s the main thing. Lise Weil - was founder and editor of the US feminist review Trivia: A Journal of Ideas (1982-1991) and co-founder of its online offshoot Trivia: Voices of Feminism, which she edited through 2011 and which is now published by an editorial collective at the University of Arizona ( www.triviavoices.com ). 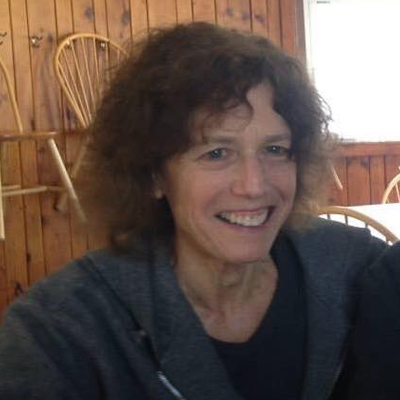 She recently completed a memoir, In Search of Pure Lust, centering on the tension between the grand experiment of lesbian-feminism of the ‘70s and ‘80s, in which she was a fervent participant, and her later immersion in Buddhist practice. In 1990, she left Western Mass. for Montreal, where she has lived ever since. She teaches in Goddard College’s Graduate Institute.